Organization isn't something that comes to me naturally. I attract clutter like a magnet and four boys can quickly leave the house looking like a tornado came through. 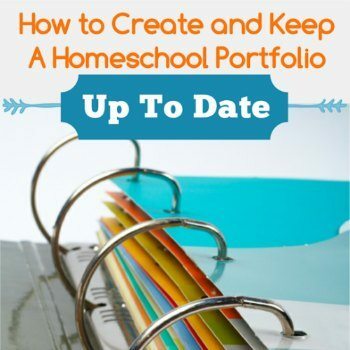 One of my favorite things about Pinterest is all the neat organizational ideas I find that work for REAL people, with children that would destroy any of those expensive or meticulous methods. 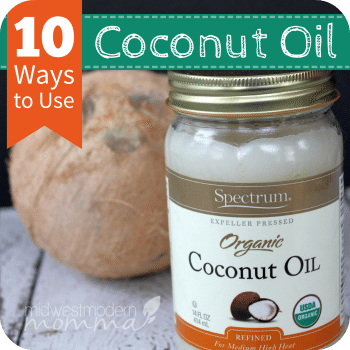 Here are 1of my favorite tricks and products, because they are all quick & most utilize things I already had on hand. Instead of throwing away old wipe containers or stuffing them full of crayons, Mission to Save put together a quick video on how to link grocery sacks & store inside a baby wipe container to keep them organized and on hand for easy access. 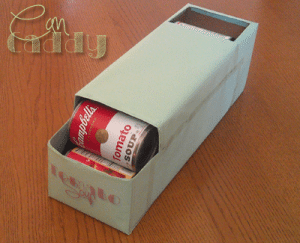 Make your own can organizer and keep your pantry/cupboard organized, using a soda box! I love the label Freetail Therapy created for the front of her Tomato Soup caddy. 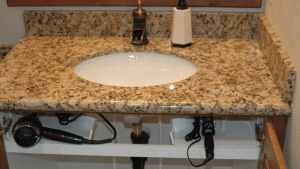 Jen from a thousand words has a great post on how she organized under her sink. I love how she hung the spray bars to save space! 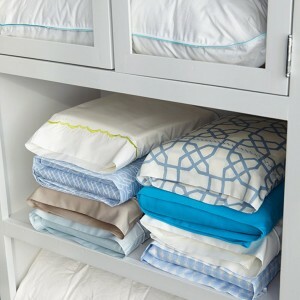 Utilize blank space between shelves or under the bottom shelf with one of these under the shelf baskets. 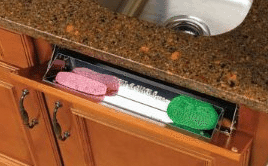 Amazon carries a wide variety of these tip out trays, so you can hide your sponges, washclothes, and other small items instead of leaving them sitting along the sink. 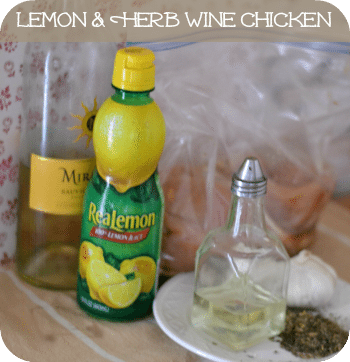 These would work great for the kitchen or bathroom. 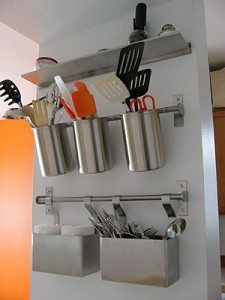 I love the idea of “hiding” some of my utensils on the side of my cupboard. Right now, they are crammed into a few different crocks. My husband recommended throwing some of them away, but changed his mind when I suggested throwing away some of his tools so he didn't need another tool box. 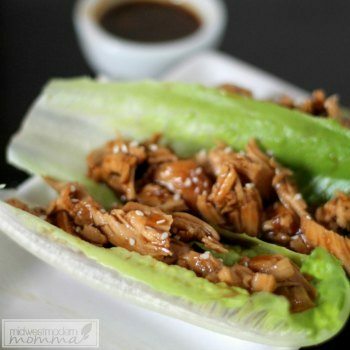 Not Martha has a great tutorial on how to make these yourself. Not Martha also showed how to utilize a short wall with hanging baskets & canisters. 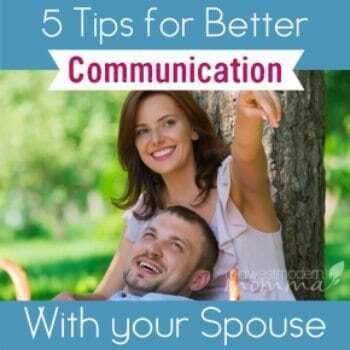 My husband can't stand when I leave my flat iron out, but putting it away hot isn't an option. Well, it wasn't until I found this nifty tool. Mine actually installs behind the fake drawer with a flip down hinge. It has space for my blow dryer on one side, along with my different diffusers, and the other side holds my curling iron & flat iron. Amazon carries one that fits vanities at least 24″ wide. 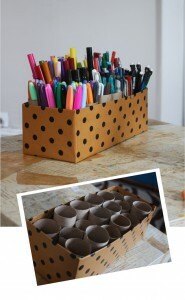 Aunt Peaches put together a quick marker caddy. I think we're going to make a set for colored pencils, markers, and crayons, and then a caddy for me. 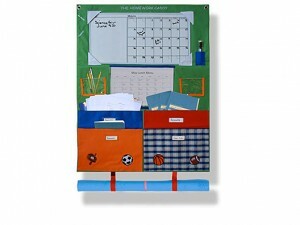 I found this nifty homework caddy at OpenSky and got a $10 credit (and free shipping) when I signed up! 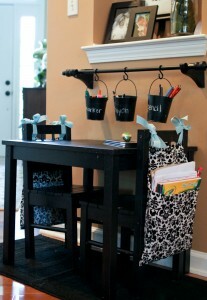 Scissors & Spatulas has a great tutorial on these seat sacks! I also love the crayons buckets, too. One way we keep the toys under control is by limiting where they are allowed. We were blessed to be able to have a large house and chose to put all the boys into a BEDroom (meaning it is only beds & just for sleeping). I did a lot of research on children that share a room and how it affects their relationship. They are not allowed to have toys in their room and toys are not to be left in the living room & dining room. They have a toy shelf with bins in both the toy room & the media room. Right now we also have quite a few totes filled with toys that are too large or just don't have a home but I plan on changing that later this week when we get the shelving unit I ordered. 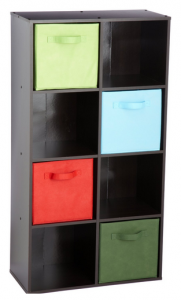 We will be putting it horizontally and using fabric baskets to organize toys by group and keeping the larger toys on top. 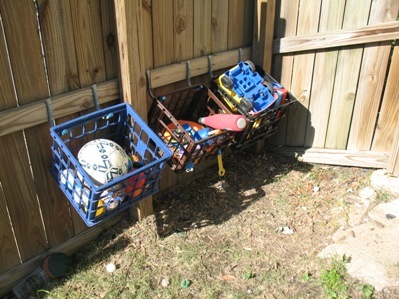 Hanging milk crates on the fence is a great way to keep outdoor toys organized. We are going to put some along the fence for the dogs toys so we have a place to put them, but at a level they can pop their heads in and pull something out. On the other fence (separate by a doggy fence to keep them out of my garden) I'm going to store all the boys' toys. 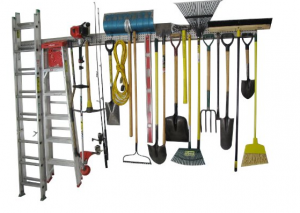 Sick of all the tools leaning against the garage wall (I know I am!)? 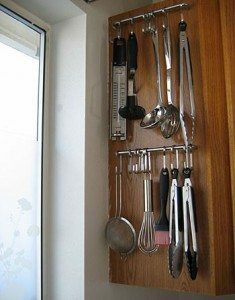 I saw this on Amazon, but you can just hang a thin strip of pegboard at the height you need & could even do a second one for shorter tools. 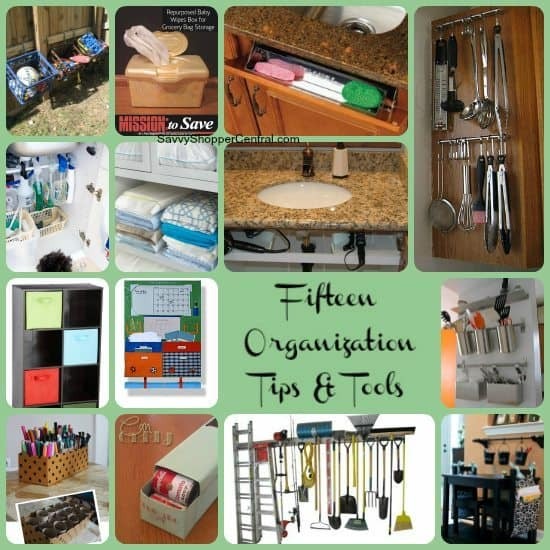 What are some of your favorite organizational tips & products? 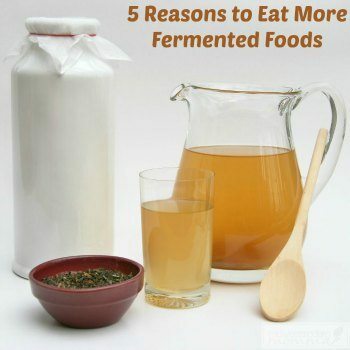 Lots of great ideas here- so clever! 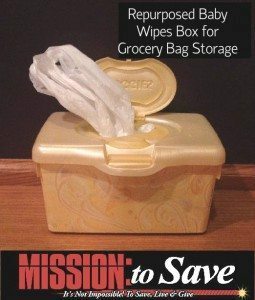 Thanks for including my wipes box post.